Homemade GRAIN-FREE Cake Donuts Recipe!! Ryan and I are still going strong in our new grain-free lifestyle. It has been life-changing and while a year ago (even a few months ago) I would’ve said that I couldn’t imagine not eating wheat, now I can’t imagine going back to eating wheat again. When we took our allergy tests (keep in mind that these were “alternative” allergy tests – no huge squares of needles in my back like I had to do in 4th grade) we both showed being very sensitive to wheat, rice, corn, AND potatoes so that meant that even the gluten-free items at the store wouldn’t work for us. We went through a few weeks of not really knowing what to eat (eggs for breakfast, salads for lunch, meat and veggies for dinner pretty much every day) but then we found out about this miracle ingredient called coconut flour. Coconut flour is very low-carb, it’s 58% fiber, can handle high temperatures, low on the glycemic index scale, and high in protein! AND you can use it to make just about anything that you would have used regular flour for… including DONUTS! You can use this basic donut recipe and add just about any fruit if you would like it to have a fruity flavor. Melt the butter and coconut oil in the microwave or on the stove. Mix all of the wet ingredients in one bowl and all of the dry ingredients in another bowl. Use coconut oil to grease your donut pan VERY WELL. When I didn't put a lot of coconut oil in the bottom AND on the sides of the pan then the donuts would stick. Fill up the greased donut pan sections about ¾ of the way full. Bake at 350˚ for 18-22 minutes. Serve with powdered sugar, coconut flakes, maple syrup, or any other toppings that you can think of! This recipe makes about 14-16 donuts. If you’re looking for a good-quality coconut flour to buy, we love the Bob’s Red Mill coconut flour and the price is the best one around (also, keep in mind that you use MUCH less coconut flour that you would regular flour since it absorbs so much liquid). Have you all lost any weight or have had any benefits such as sleeping better since going grain free? My husband (Ryan) has no need to lose weight (he’s trying to gain) but I definitely have since going grain free! I’ve been completely grain-free since mid-Feb and in the past month and a half I’ve lost 15 pounds without doing anything else differently except not having any grains. I also sleep a ton better and don’t need a nap in the middle of the day. Before going grain-free I was so exhausted by mid-afternoon that I needed a nap to be able to function in the evenings. Ryan and I will both be posting our grain-free stories to the site soon! Do you really use 12 eggs for them? Is there a place I can get the nutritional info for them? They look awesome! Do you roll them out and cut them, then bake it? 12 eggs seem like they would be really dense. Coconut flour recipes are very eggy due to the nature of coconut flour. 12 eggs in a recipe like this is very common. I just added up the calorie count and it´s around 250 per donut. Just one completely fills me up because it´s SO packed with protein and fiber! Keri Givens Pei – I pour them into a donut pan and fill each donut ring about 3/4 of the way up then bake. Thanks for the info. I´ve never used coconut flour. 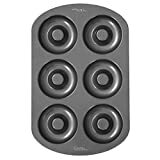 I´ve been looking for baked doughnut recipes – but I guess I need to find one of the doughnut pans first! Erin – I don´t think that mini-muffins pans would be a problem at all. I´m not sure what the time needed to cook them would be though. Can u replace eggs with other fillers? Like applesauce? Sissy Se – I´m going to be trying that for my youngest who is allergic to eggs so I´ll post an update when I do. I´ll probably use an applesauce & “chia seed egg” mix. Monica – Yeah, 12 eggs sounds like a lot but you have to use that many with coconut flour since it absorbs so much liquid and doesn´t have any gluten to keep it together. These look great. Have you ever tried to freeze them? I’m just wondering how they would turn out. I bet it would work well though! Do you know what can be used to replace the butter? Google Reader Is Going Away – What Is The Best Alternative?